The Baking Bible from Rose Levy Beranbaum is the magnum opus from "the most meticulous cook who ever lived." Her detail oriented instructions are written with the home baker in mind. She lays out a set of golden rules to help bakers at all levels prepare the best cake, pie, bread, or muffin they have ever tasted. These rules are simple but often overlooked. For example, make sure you read the entire recipe before beginning to bake or set out all the ingredients in their exact quantities. 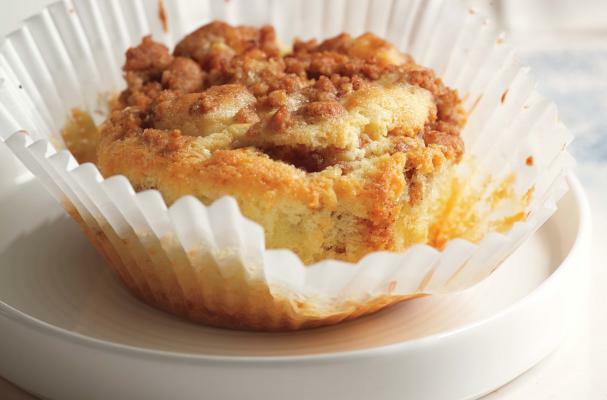 Even with an easy recipe like coffee crumb cake muffins Beranbaum lays out explicit directions so that the baker knows exactly what to do before even measuring the flour. These muffins are a delicious quick bread that are perfect for breakfast, brunch or even a snack. Serve these muffins with a tall glass of milk or warm cup of coffee. This is my all time most loved coffee cake baked in a muffin pan for individual size servings. I love the way the batter rises up and over part of the apple slices, resembling a wee chef’s toque. Special Equipment Six large cupcake liners set in a Texas size muffin pan or large custard cups (1 cup capacity). Make the Crumb Topping In a food processor, pulse the walnuts, brown sugar, granulated sugar, and cinnamon until the walnuts are coarsely chopped. Remove ¼ cup/ 1 ounce/30 grams to use for the filling. To the remainder, add the flour, butter, and vanilla and pulse briefly to form a coarse, crumbly mixture for the topping. Scrape it into a medium bowl and refrigerate for about 10 minutes to firm up the butter to make it easier to crumble for the topping. Use your fingers to pinch together the refrigerated crumb topping, breaking up the larger pieces so that about one-third of the mixture is formed into small clumps and the rest is in small particles. Make the Crumb Topping: In a food processor, pulse the walnuts, brown sugar, granulated sugar, and cinnamon until the walnuts are coarsely chopped. Remove ¼ cup/ 1 ounce/30 grams to use for the filling. To the remainder, add the flour, butter, and vanilla and pulse briefly to form a coarse, crumbly mixture for the topping. Scrape it into a medium bowl and refrigerate for about 10 minutes to firm up the butter to make it easier to crumble for the topping. Use your fingers to pinch together the refrigerated crumb topping, breaking up the larger pieces so that about one-third of the mixture is formed into small clumps and the rest is in small particles. Preheat the Oven: Twenty minutes or longer before baking, set an oven rack in the middle of the oven and preheat the oven to 350°F/175°C. Prepare the Apple Slices: Just before mixing the batter, peel, core, and slice the apple into rings ⅛ inch thick (6 slices/2.7 ounces/77 grams). Do not be concerned if they break in half. Use a fingertip to dab the slices with the lemon juice. Mix the Liquid Ingredients: In a medium bowl, whisk the egg yolks, 1½ tablespoons of the sour cream, and the vanilla, just until lightly combined. Make the Batter: In the bowl of a stand mixer fitted with the flat beater, mix the flour, sugar, baking powder, baking soda, and salt on low speed for 30 seconds. Add the butter and the remaining sour cream and mix on low speed until the dry ingredients are moistened. Raise the speed to medium and beat for 1½ minutes. Scrape down the sides of the bowl. Starting on medium-low speed, gradually add the egg mixture in two parts, beating on medium speed for 30 seconds after each addition to incorporate the ingredients and strengthen the structure. Scrape down the sides of the bowl. Spoon the batter (2.3 ounces/64 grams) into each of the prepared liners. The liners will be about half full. Sprinkle each with 2 teaspoons of the crumb filling. With a small metal spatula or spoon, fold the crumb filling into the batter with three or four strokes. Set an apple slice on top of each and press it down so that some of the batter rises up a little above the slice. Smear it across the top of the slice. Spoon about 2 tablespoons of the crumb topping evenly over the top of each muffin and use your fingers to press it down gently. Cool the Muffins: Cool the muffins in the pans on a wire rack for 10 minutes. Remove them from the pans and set them on a wire rack. Cool completely. Store: Room temperature, 3 days; refrigerated, 5 days; frozen, 2 months. Highlights for Success Use liners for the best shape because these muffins tend to dome and collapse without them.